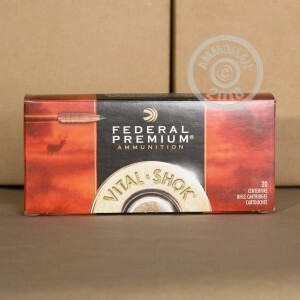 If you're looking to go big or go home with your .300 H&H Magnum rifle, this load from Federal's Vital-Shok line is a great choice. 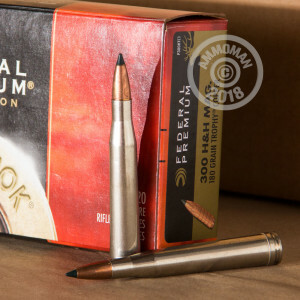 The cartridges in this 20-round box fire 180-grain jacketed hollow points that are on the lighter, faster end of the spectrum for the .300 H&H, and deliver a muzzle velocity of 2,880 feet per second as well as a flat, accurate trajectory even at long ranges. Like other Federal ammo, these cartridges use non-corrosive Boxer primers and brass cases. 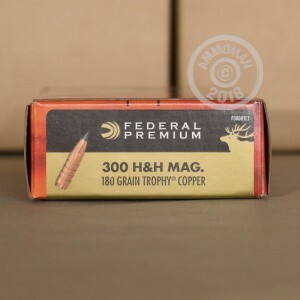 Shooters looking for a step up in power from the .30-06 have turned to the .300 H&H since 1925, when the cartridge was introduced by London-based gun manufacturer Holland & Holland. 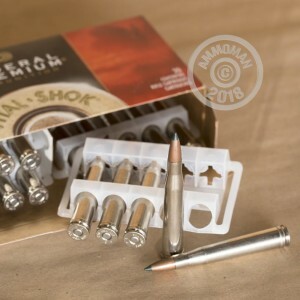 This deadly round is known for its superb power and high recoil and enjoys great popularity among big game hunters.